The vacancy created on the Florida Gators coaching staff when defensive line coach Bryant Young resigned one week ago has already be filled. The school officially announced on Wednesday that UTEP Miners defensive coordinator Jeff Choate has been added as the new special teams coordinator and outside linebackers coach. 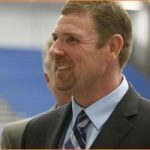 Choate, who accepted the position at UTEP just over three months ago on Jan. 8, after the program hired Sean Kugler to be its head coach, was the linebackers coach at Washington State under Mike Leach during the 2012 season. He spent the previous six years primarily as special teams coordinator for the Boise State Broncos. During his tenure at Boise State, Choate also coached running backs (2006-08), linebackers (2009) and nickel backs (2010-11). He was a member of the same coaching staff as current Gators offensive coordinator Brent Pease, who also worked with the Broncos from 2006-11. Muschamp has been looking to fill his squad’s special teams coordinator job ever since he promoted D.J. Durkin to defensive coordinator following the 2012 season. He originally stated that special teams, in absence of its own coach, would be taught collectively by his staff. However, following Young’s resignation, Muschamp conceded that he would prefer to bring on a special teams coach. Under Choate, Boise State put together consistently productive special teams units. He coached Kyle Brotzman – the highest-scoring kicker in NCAA history and the team’s all-time leader in punting average – as well as skilled returners like Titus Young (kickoffs) and Kyle Wilson (punts). College football analyst Phil Steele considered the Broncos’ special teams unit to be the best in the country in 2009 and second-best in the nation one year earlier in 2008. He began his college career as a graduate assistant at Utah State who was quickly promoted and served two seasons as special teams coach (2003-04). Choate held the same position in 2005 with Eastern Illinois before being hired by Boise State. The connection between Pease and Choate appears to go back a long way. The former Idaho high school football players grew up 70 miles apart with Pease playing quarterback at Mountain Home High School and Choate playing linebacker for St. Maries High School. Pease played at Montana in 1985-86 and returned to the program as a coach from 1991-98. Choate, at the time Pease was coaching approximately 175 miles away, played for Montana-Western and was eventually hired on for two seasons as an assistant coach as he completed his degree. Welcome to the ORIGINAL Orange & Blue, Coach Choate! Sweet! Another high energy guy. Another step in the right direction. If Dillman and Champ had a love child he would be named Choate. Looks like a great hire. Only problem I see here is when Pease leaves for a HC job you can bet Choate will be going with him as the DC. Does this mean we wont see Champ and Zooker going off on the same sidelines? Was looking forward to that possibility. If Pease gets a HC position in the near future, that would mean he got the UF offense firing on all cylinders at some point, so I’m all for it. Yeah, well things look good from the top of the ‘Mountain West’ until a major team in a major conference calls…. If our coaches get jobs elsewhere, that means Foley and Muschamp are doing a great job. Can’t shy away from hiring talent for fear that talent will eventually be offered better positions. That’s the nature of the profession, the price of success, and would only speak well for our program. I’m sure Saban has the same problems. You just go out and find the next talented guy to fill the shoes of the guy who just left. Got to keep moving forward. Just ask the Baltimore Ravens about what comes with winning championships. I hope that we too have that problem soon.